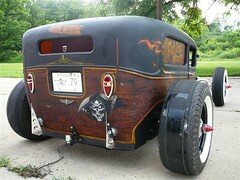 Rat Rods continue to grow in popularity. They range from old beater 50’s machines in a combination of primer and rust to miscellaneous parts scavenged from a junk yard to make a vehicle for cheap. Others are highly engineered and mechanically advanced with suade paint jobs. Still others are pure rust buckets that are unsafe to drive. Some of these cars are little more that 3D cartoons; one I remember is an outhouse on wheels (we have the photo). I am for this trend continuing and growing. In no way do I ever think it will replace the trailer queens, beautiful customs or restored muscle cars but this trend does fill a niche. I provides a way for a guy or gal to build a car for little money and get into the hobby with a car that will be accepted at most shows. It also provides a way to build a highly engineered and professional ride that can be driven anywhere and still be safe. However, I do hope that builders abandon the very unsafe cars that I have witnessed at some events. 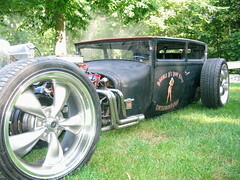 We have and will continue to post Rat Rod photos we see around at shows on our new Rat Rod page. Click Here. If you have or are building a Rat Rod you would like to see on our site, email us some information and photos or your project. We will continue to post these on the site as space permits. Digital photos only, we will not return any hard copy photos mailed to us.